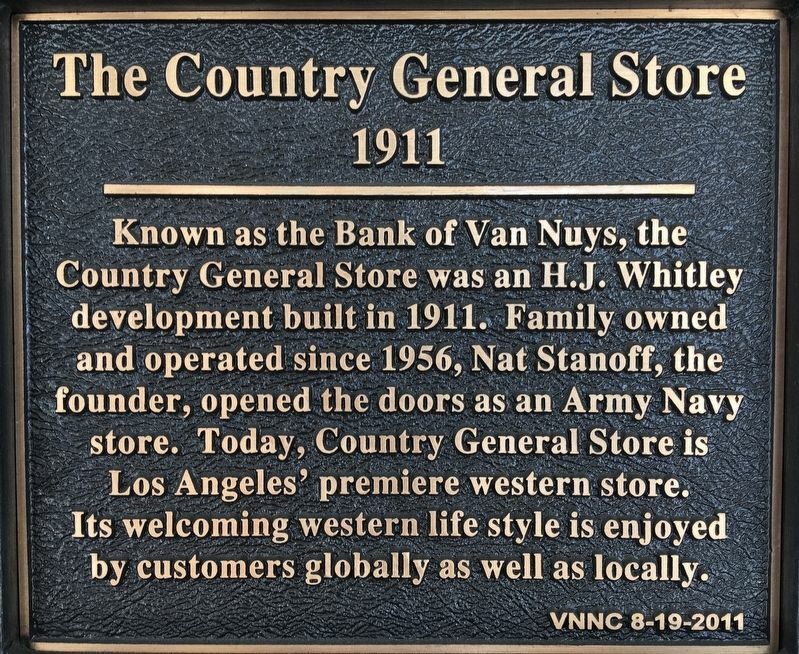 Known as the Bank of Van Nuys, the Country General Store was an H.J. Whitley development built in 1911. Family owned and operated since 1956, Nat Stanoff, the founder, opened the doors as an Army Navy store. 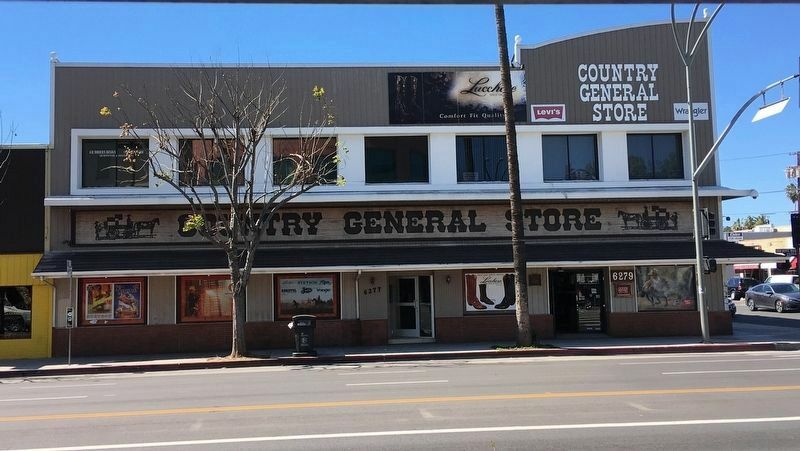 Today, Country General Store is Los Angeles’ premiere western store. Its welcoming western life style is enjoyed by customers globally as well as locally. Erected 2011 by Van Nuys Neighborhood Council. Location. 34° 11.072′ N, 118° 26.933′ W. Marker is in Van Nuys, California, in Los Angeles County. Marker is at the intersection of Van Nuys Boulevard and Sylvan Street, on the right when traveling south on Van Nuys Boulevard. Touch for map. Marker is at or near this postal address: 6279 Van Nuys Blvd, Van Nuys, CA 91401, Van Nuys CA 91401, United States of America. Touch for directions. (approx. 3.1 miles away); De La Osa Adobe (approx. 3.3 miles away); Amelia Earhart (approx. 4.2 miles away); Lankershim Train Depot (approx. 4.2 miles away); Mulholland Drive Bridge (approx. 4.3 miles away). Touch for a list and map of all markers in Van Nuys. More about this marker. This is one of a dozen markers created by the Van Nuys Neighborhood Council for the centennial of Van Nuys, founded in 1911. Most of the markers have not been installed. More. Search the internet for The Country General Store. Credits. This page was last revised on March 22, 2019. This page originally submitted on March 18, 2019, by Craig Baker of Sylmar, California. This page has been viewed 40 times since then. 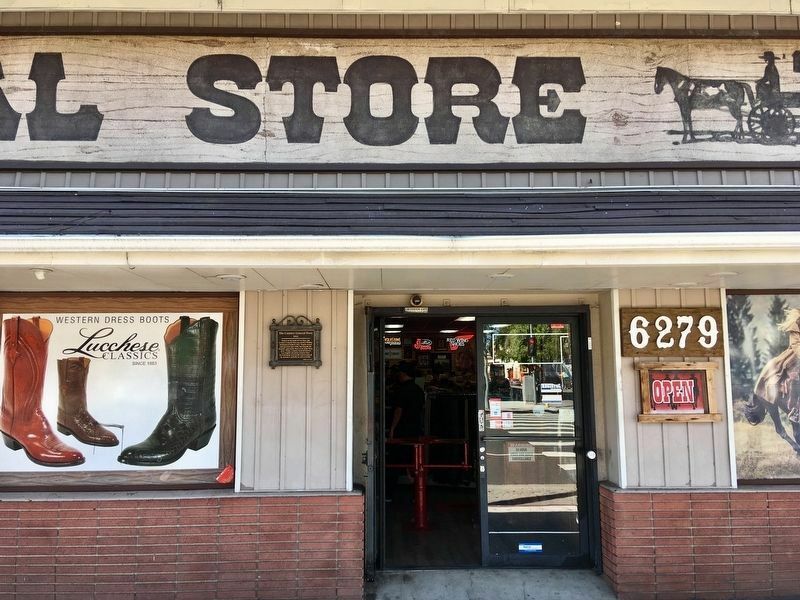 Photos: 1, 2, 3. submitted on March 18, 2019, by Craig Baker of Sylmar, California. • Andrew Ruppenstein was the editor who published this page.